We’d love your help. Let us know what’s wrong with this preview of Platform by Michael Hyatt. To ask other readers questions about Platform, please sign up. Michael, re Platform, is this optimal? 1) Amazon sends me an ad. First book is Platform. (I've recently bought ten books on book marketing. My first novel is almost ready to go.) This is good! 2) I want to click Add this to my 'to read' and 'book marketing' shelves. (I batch my book orders to get free shipping.) But I have to go to GR, find your book, click 'To Read' and then... Kick 'em for me! I found this book to be chocked full of good information on how to sale a product. Anybody else? Amongst all the hype of a vanguard internet mega-book launch by Michael Hyatt (124,000 Twitter followers; 400,000 blog readers/month), the chairman of Thomas Nelson publishing (the 6th largest US book publisher, Nº1 Christian publisher) on the subject of `how an author might use the internet to broadcast his message', it's clearly difficult to separate the book (Platform) from the man (massive levels of experience) and the marketing campaign (shockingly effective and generous) but, this being a book review, I shall try. Michael obviously knows what he's talking about here and in just under 300 pages he provides a wealth of information for anyone who wishes to use blogs, Twitter and Facebook to build relationships online, to try and get their message across and to ultimately sell whatever it is they're hawking (books, political messages, etc...). He has based his book on the posts he has written on his own blog about how to blog and use social media, so much of the actual material seems to be available online if you search for it (here are chapters 2, 3, and 15, for example), although he has rewritten some paragraphs and added some new anecdotes to illustrate his points. The book is organised into five broad sections which walk you through the major functional and relational steps related to blogging and the wise use of social media, and they explain the knowledge Michael has accumulated in building and promoting his own substantial platform over the past eight years. I think after reflecting on this for a few days that the book's effectiveness and a consideration of whether or not it achieves its main aim depends on who is reading it. If you have never come across Michael's work before, or if you have just begun blogging and are thinking about building your own platform, you would save a lot of time and energy by buying a copy of Platform and its contents will probably produce a `wow' sensation (section 1: "Start with the Wow", chapter 2: "Bake in the Wow", chapter 7: "How to Wrap the Wow in Style") in your mind as you read along and think about the possibilities. I can think of a few friends who have just started blogging to whom I would certainly recommend this book. If, on the other hand, you have been reading Michael's blog for a while, if you have yourself been blogging for a few years (if not to Michael's level of success), if you have read some of the better business books that have been published over the last few years, if you have read previous blogging and social media books by other authors (Gary Vaynerchuk's "Crush It! ", Seth Godin's "Tribes" or Chris Brogan's "Trust Agents"), or if you have read and tried to learn from popular how-to blogs (Problogger or Copyblogger), I predict you will not feel such a `wow' sensation as you read and that you will be left instead with the feeling that this is clearly a solid revision of what are becoming accepted success principles for blogging and social-media but that there is nothing particularly new here; that this book does not add new knowledge to the conversation or to theories about how to do it all better. Before I read Platform, and given the Christian slant of both Thomas Nelson and most of the people who have participated in the pre-launch Facebook group, I wondered if there might be some interesting religious metaphors (followers, tribes, messages, etc) to be applied to the book's ideas, or if the book might be directed towards a Christian audience. Platform purposefully does neither of these things: its ideas are applicable to anyone wishing to use them. This general focus is perhaps also why I felt it was disappointing that the book didn't include much specific information--apart from an appendix on "Post Ideas for Novelists (also a blog post)"--for authors who wish to use these ideas . Whilst this is by design, I think I expected more in this sense from the chairman of the US's 6th largest publisher, who himself has built a hugely successful online platform. To conclude, then, Michael Hyatt's Platform is recommendable as a solid guide to blogging and social media principles and practice if you are a newcomer to these ideas but more experienced bloggers or aspiring authors won't find anything especially new or specifically relevant in the book that hasn't been said before somewhere. "... Create products you would personally use - Create products that solve problems in unexpected ways - Create products that exceed your customers’ expectations..."
"... What is the product or experience I want to create or transform into a wow? The customer’s lobby experience. 2. How will the customer feel as a result of this experience? (In other words, what is the specific outcome we want to create?) The customer should feel we must be an extraordinary company because he has never had a lobby experience like this. He assumes we are somehow really different, and can’t wait to experience more..."
but beyond that it offers more - a lot more. After reading the book I realized that I needed a media kit (I had abandoned mine a while ago because it did not work); Hyatt's book offers excellent samples how to create one that will work better. The truly interesting factor about Hyatt's book is that seems to address information for newbie as well as information for authors who have already climbed the ladder, who have books to show. At first I was a bit irritated by this, then I realized the greatness of this concept. On one hand, the newbie author can use the book to get started, set up basics, but at the same time he can find out, where he should be going, what the "final goal" is. If you have started any kind of endeavor you know how important it is to plan ahead, if you do it right you can save time (and money) to correct errors that might happen "along the journey." Vice versa, the season author, for whom the more sophisticated elements of this boo are written, can use the basic information to check if /she has set up all information correctly, if he or she covered all basics. That's the way I used it and I really like what I see. "... No one is likely to do it if you don’t. I wish this weren’t the case, but for 95 percent of us it is. This is why you must take matters into your own hands. Don’t let someone else babysit your french fries. Let me suggest that you take a long look in the mirror. The person you are looking at is your new chief marketing officer. Take responsibility for your own success and invite others to join you in the endeavor..."
I meet too many new authors, who think that being present on social media platforms will do the trick. " Platform: Get Noticed in a Noisy World" presents the fact and offers solutions. Recommends it for: Anyone who wants to build a speaking, writing or social media platform. Building a platform is essential. As a writer, I've heard that a million times. Maybe more. The exhortation usually comes with a few specifics: blog, engage on Facebook and Twitter. Until now I've been following that advice blindly, doing what is required to participate in a changing industry. But, now I have a secret weapon--A platform-building coach in the form of Michael Hyatt's book, Platform: Get Noticed in a Noisy World. Platform took me beyond the bullet points and provided a blueprint for Building a platform is essential. As a writer, I've heard that a million times. Maybe more. The exhortation usually comes with a few specifics: blog, engage on Facebook and Twitter. Until now I've been following that advice blindly, doing what is required to participate in a changing industry. Platform took me beyond the bullet points and provided a blueprint for building a platform that will help me engage others on the topics close to my heart. I'm excited to implement the action points Michael Hyatt so generously provides. I've been reading his blog for years and have watched his platform grow exponentially. I never imagined he would take all he learned from his successes and failures and make those lessons available to me (and you). Great overview of marketing and platform building. This book is scannable and a great resource as either a reference or a straight read. The book is very blog and Twitter centric and even Hyatt admits he doesn't quiet get Facebook. Many social media books are full of lots of fluffy stories and little in real take away. This book is different, it goes light on the fluff and high on the take away tips. Platform gets 4 stars only because Facebook is too big to ignore and because this book ignores F Great overview of marketing and platform building. This book is scannable and a great resource as either a reference or a straight read. The book is very blog and Twitter centric and even Hyatt admits he doesn't quiet get Facebook. Platform gets 4 stars only because Facebook is too big to ignore and because this book ignores Facebook (for the most part). There is no mention of EdgeRank and the advice on how to migrate a personal page to a fan page is dated, the process is much easier now. That said, you are not likely to find better blogging or Twitter advice anywhere. I feel weird giving this book a rating. My 5 stars reflects where I’m at personally at the moment. A year from now? 5 months from now? Who knows. I might have a totally different opinion or see more flaws in the whole thing. This book helped me think through a lot of what I need to do in my...business?...brand? I hate calling it either of those things. It made the steps I need to take look a lot less daunting. I’ve been freaked out at all the work ahead of me but Hyatt is so good at making the pa I feel weird giving this book a rating. My 5 stars reflects where I’m at personally at the moment. A year from now? 5 months from now? Who knows. I might have a totally different opinion or see more flaws in the whole thing. In my opinion there were just way too many chapters based on Twitter, a service I don't personally use, so I guess I'm being a little biased towards all that much paper being dedicated to it. The author admitted his distaste for Facebook, but obviously new very little about it. His rant which was mostly negative pertaining to Facebook was extremely outdated, considering the fact that this book was just released not too long ago. Referring to Facebook Pages as what were once called Fan Pages in hi In my opinion there were just way too many chapters based on Twitter, a service I don't personally use, so I guess I'm being a little biased towards all that much paper being dedicated to it. The author admitted his distaste for Facebook, but obviously new very little about it. His rant which was mostly negative pertaining to Facebook was extremely outdated, considering the fact that this book was just released not too long ago. Referring to Facebook Pages as what were once called Fan Pages in his one chapter dedicated to Facebook just proves his lack of knowledge pertaining to the world’s largest and most successful social media platform. He also failed to mention one of their latest and most successful updates used by some of the best bloggers and social media experts, which would be Facebook's subscribe option for personal profiles. This is a very good primer on being "old school," and launching a product or service in today's world. It's not flashy, it's not "whiz bang," but instead it's methodical, plodding and doable. I have successfully done - then abandoned - so many of these techniques that I looked to get motivated to rebuild that platform. I read this book at the suggestion of Hal Elrod, author of best-selling book The Miracle Morning. It did not disappoint: a nice mix of practical advice and story, it lays out the how-to for creating a platform for one's books and brand. Well done. I really enjoyed this, and found a lot of areas for practical application. There were some typical business rah-rah sections, but in the main this was very worthwhile. If you're looking to build an online audience, you'll find this book very helpful.
" . . .in a global economy crowded with millions of competitors, quality is just the beginning." So says Michael Hyatt on the book jacket of his information packed book, "Platform: How To Get Noticed In A Noisy World." I wish I'd read this book four years ago when I first bought it. On the other hand, perhaps I wasn't ready for it back then. Now that I have my own website, am regularly blogging, and involved on social media, I have a better understanding of all that Mr. Hyatt discusses and can e " . . .in a global economy crowded with millions of competitors, quality is just the beginning." 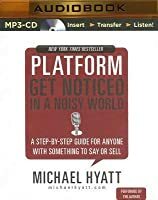 So says Michael Hyatt on the book jacket of his information packed book, "Platform: How To Get Noticed In A Noisy World." I wish I'd read this book four years ago when I first bought it. On the other hand, perhaps I wasn't ready for it back then. Now that I have my own website, am regularly blogging, and involved on social media, I have a better understanding of all that Mr. Hyatt discusses and can easily apply the principles to what I'm doing now. Back then, I may have felt like a first grader in a high school course of study. At any rate, this book is excellent, whether you are promoting a small business, trying to sell the latest and greatest widget, or attempting to promote yourself as an author, speaker or artist. This isn't merely a book; it's a handbook. I would be wise to refer to it over and over, to go back through it with a highlighter and to devote time to applying the principles in each chapter. I have one reservation as I read it. The copyright is 2012, six years ago. How has social media changed? Would Mr. Hyatt give the same advice today as he did six years ago? How has Twitter and Facebook changed? Is he still as "pro-Twitter" as he mentioned in the book? And would he still support trying to post shorter blog several times a week. I was recommended this book from some other church leaders who said it would help with creating an online marketing strategy. I would say that the book did a fair job in doing that. Truly, this book is an excellent choice for anyone who has a blog or online business and wants to be more purposeful in using social media. The first few chapters that talk about creating a wow factor are probably worth the entire book. What’s also helpful is the book doesn’t have to be read sequentially-the chapters I was recommended this book from some other church leaders who said it would help with creating an online marketing strategy. I would say that the book did a fair job in doing that. Truly, this book is an excellent choice for anyone who has a blog or online business and wants to be more purposeful in using social media. The first few chapters that talk about creating a wow factor are probably worth the entire book. Filled with valuable advice that's easily actionable. However, enough time has passed since the book's release in 2012, that I'd welcome a refreshed version. For professional bloggers and wannabes. High tech references mixed with common sense basics but readable. A nearly impossible DIY. Makes me wonder if we are on the edge of techies decluttering this process. Needs to happen. Like washing clothes on rocks and then... the washing machine! Please someone. Disclosure: I won this book in a blog contest, but in no way was I required to leave a good review. As a big name in publishing, Michael Hyatt seems like the kind of person a writer wanting to be a published writer would want to hear. You get an "insider's view" of things. Platform does this to a degree, though I found myself washing from an encouraging "hey, I can do that" to a discouraged "I can't afford to do that!" Hyatt encourages lists, so here, to the best of Goodreads' ability, is my bulle Disclosure: I won this book in a blog contest, but in no way was I required to leave a good review. • Hyatt obviously writes from experience. He knows what sells and what doesn't. He knows how to sell in today's market, and it's not your daddy's market. • Hyatt has been there, done that. He has his own platform, which was the original source of this book's content. He knows what works for him, and what failed miserably. He doesn't hold back on admitting his own mistakes. • Hyatt provides sample text from his own platform for the reader to modify and use. • Hyatt makes the book readily readable from cover to cover, or skipping section to section as the reader needs. He even provides an index in the back for later reference. • Hyatt covers Twitter in great detail. For those who are already familiar with this classic "microblogging" platform, the read is tedious. For those who are unfamiliar with Twitter, though, Hyatt includes some rather dated information, such as using the old-style RT text for manual post sharing (or "retweeting") instead of the new built-in version that doesn't limit the length of a tweet to even less than 140 characters. His suggestion of URL shorteners such as bit.ly is also no longer necessary, now that Twitter does this for you (whether you like it or not). • Hyatt is equally vocal in his experience with self-hosted Wordpress for a blogging platform. I am impressed that he admits, at least in some chapters, that other options are available, though better suggestions for options on those platforms would've been appreciated. • In general, mentioning tools used and how to integrate them into a single platform are welcome suggestions, but the information can become outdated quickly. Where will Buffer, for example, be in 2 years? Will HootSuite still connect to Twitter and Facebook when someone else reads this book? Other platform enhancers, such as Pinterest or even Google+, are completely ignored. That's not bad for blog posts that can be updated, but it limits the period of time this book's content will be useful. • In numerous places throughout the book, Hyatt seems to forget that some of us looking for a platform don't have a former CEO's nest-egg. Some chapters talk about the necessity of certain features or practices, and suggests that "a few hundred dollars" isn't all that expensive. Perhaps that is true for what you receive in return, but many of us simply don't have that extra cash available to build our platform. Some hope that the product or service for which we are building our platform will get us that few hundred dollars extra. Too many times Hyatt doesn't offer much encouragement for those who simply cannot afford the cash outlay. • I won a hardcopy of the book, but I was also eligible for Kindle and Nook versions free. The formatting in some areas left much to be desired. This could be limitations of the Kindle and Nook apps for Android phones, though. 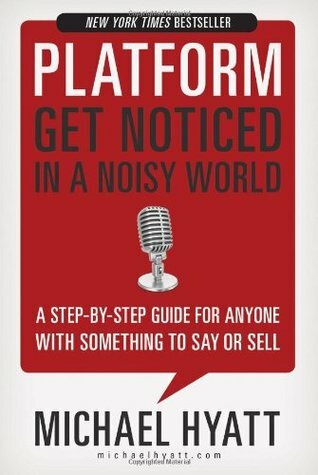 Platform: Get Noticed in a Noisy World is the book I’ve been waiting for, the book I wish I read years ago. As the second subtitle states, author Michael Hyatt lays out “a step-by-step guide for anyone with something to say or sell.” Clearly, concisely and in easy-to-understand prose, Hyatt gives instructions from product development, launch, and marketing. I found the chapters on using social media especially helpful. Hyatt shares what worked for him and gives helpful guidelines. For example, the twitter chapters start with the value of twitter, and proceed through how to set up an account, find followers, and how to efficiently use twitter to your advantage. Few people go into such detail, or offer such practical details such as how often to tweet or what kind of content to include or how to automate and schedule your tweets. To be sure, Hyatt had a head start on most of us when it comes to building a platform because of his long career in publishing, including eight years as CEO of Thomas Nelson Publishers. But that doesn’t diminish his success in using social media to promote his books, or mean that his advice won’t work for an average person. So in this book Michael Hyatt mentions he's the author of four books including another book on the NYTimes bestseller list, only he doesn't mention what they are. I looked into his back catalog to see what they were. Two of them were alarmist warnings about the coming computer meltdown, Y2K (published in the late 90s). The other book (which Hyatt does mention) was a book about guarding your family's privacy in an internet age. This book is different than that. It is a business book designed to h So in this book Michael Hyatt mentions he's the author of four books including another book on the NYTimes bestseller list, only he doesn't mention what they are. I looked into his back catalog to see what they were. Two of them were alarmist warnings about the coming computer meltdown, Y2K (published in the late 90s). The other book (which Hyatt does mention) was a book about guarding your family's privacy in an internet age. This book is different than that. It is a business book designed to help you increase your platform--online or otherwise. Hyatt shares the methods that have made him successful in the publishing world, in business and on the interwebs. You will learn from this book how to increase your blog traffic, how to present yourself better, how to gain a following and make use of social media. Hyatt tells you numerous times how good he is at this. After all hundreds of thousands of people read his blog. while the tone of this book is too self congratulatory for my tastes, I a actually found a number of helpful tips for managing my online profile and maximizing my impact. The chapters are short and pithy and are each stand alone essays. That is how you should read them. As a literary whole this book is too repetitive but most chapters give pointers in lists and bullet points which you could follow or not follow at will. I am not an avid reader of Michael's blog, but it seems like much of this book first found life on his blog. 1. Michael Hyatt has the luxury of building a platform when he already had the credentials. He was the big boss of Thomas Nelson Publishing went his blog went big, quite a different starting point than most of us. So with some of his advice I felt it was just a little too easy. 2. I feel some of what he advices is dated, maybe even outdated. It sure worked a couple of years ago, but the world has changed a lot since then. Take blogging, that was a surefire way to get noticed if you did it right, but people are reading less blogs and it's much harder to get noticed, even when you are good. This book is easy to read and incredibly practical. If you are trying to launch anything, whether it is a business, a non-profit, a ministry, or a creative project you will need a platform from which to launch it. This book should be your go-to resource for building that platform. 1. Read it through, cover-to-cover. 2. Read it with a highlighter in your hand and mark passages and tips that are particularly relevant to you and what you are trying This book is easy to read and incredibly practical. If you are trying to launch anything, whether it is a business, a non-profit, a ministry, or a creative project you will need a platform from which to launch it. This book should be your go-to resource for building that platform. 2. Read it with a highlighter in your hand and mark passages and tips that are particularly relevant to you and what you are trying to launch. 3. You will often find that entire chapters are relevant (there were 14 such chapters for me). Go to the Table of Contents and highlight that chapter title. This will save your highlighter ink. 4. Go back through all of the chapters and create a list of actions that you need to take in order to complete a successful launch. I'm a first time writer (just finished my novel), and I picked up the audiobook version. There's good stuff in here, but the book's geared towards people who want to generate revenue, or create bigtime buzz from their blogs, from their online presence. Some of this applies to me, and the parts that were geared towards the business side of things I skipped. The author has a distracting habit of making lists to keep things readable and easy to digest. I don't know how these play out on the page, but I'm a first time writer (just finished my novel), and I picked up the audiobook version. The author has a distracting habit of making lists to keep things readable and easy to digest. I don't know how these play out on the page, but listening to the audiobook reader go through list after list made me want to skip to the next track, which I did quite often. There's some good advice in here, but as the years go on more and more is becoming outdated. A lot of the advice provided by Hyatt is either things that you've heard a thousand times, or theings that worked for him, but are not neccessarily repeatable. A few hundred dollars to a CEO is a bit different than a few hundred dollars for someone just starting out. He goes over what's worked for him, and this book is deeply tied into his own story and journey in social media. There's some interesting t There's some good advice in here, but as the years go on more and more is becoming outdated. If you want to get noticed for anything, this is the book. I've been building a platform for the past six years in order to promote the book I wrote. I've also been reading Michael's blog for years. Still, I'm learning so much. He covers everything you would ever need to know from blogging to making video posts, to setting up specific web pages, speaker pages, etc. Way too much to describe here. Just know the small amount you pay for this book is minimal compared to what you get in return. I cou If you want to get noticed for anything, this is the book. I've been building a platform for the past six years in order to promote the book I wrote. This is the fifth or the sixh book that i read about building personal branding on the internet or using social media channels. But the difference here is that Michael Hyatt is the one behind it, and that is why it's worth the 5 stars, he did a great job. indeed, this book is a must read for any blogger, business person who is trying to build his career/image using internet platforms. well detailed book, with full of experience. I enjoyed it, but I'm sure I already read almost all of it on his blog. I was hoping for a bit more coherence and a bit less "10 tips for" everything. That said, there are some tremendously helpful things in here, and I'm sure I'll refer back to it often. What I found most helpful was Hyatt's insight into the contemporary marketing scene. "I have good news. Marketing is dead." The whole idea of building a brand and winning a "tribe" is a helpful framework for getting an idea out there. This book covers the basics of promoting ideas and products in todays virtual marketplace. It focusses heavy on online presence, declaring traditional marketing dead or near to dead. I agree with that to the extent that it's especially true for persons or companies with little budget for a full fledge marketing campaing. For them this book is most valuable.